Outside the academics and experts’ circles, discussions around weapons commonly make the news in at least three main cases: either when a brand-new weapon is being developed or used, when a well-known prohibited weapon is employed on the battlefield, or when an existing weapon is used in a controversial way. Incendiary weapons or substance in warfare carry a special abhorrent meaning in the collective unconscious, not least since the picture of the ‘napalm girl’ fleeing during the Vietnam War after surviving a napalm attack. Contemporary controversies include the use of white phosphorus (WP) ammunition as a weapon, for example, by the United States in the assault against Fallujah in 2004 and governmental helicopters dropping incendiary ‘barrel bombs’ in Syria. The use of flamethrowers in war, in particular man-portable ones, is nothing new. However, the recent announcement by billionaire tech entrepreneur Elon Musk of the upcoming sale of a flamethrower renewed the debate over the legality of a weapon whose use on the battlefield was largely abandoned. Interestingly, arguments on the legal restrictions revolve mostly around the norms on the protection of civilians. The recent publication of a piece making The Tactical Case for The Flamethrower and merely referring to a U.S. 2003 Army Field Manual, largely overlooks the relevance of another fundamental norm of international humanitarian law (IHL) on the regulation of weapons: the prohibition of superfluous injury or unnecessary suffering. Highlighting the various military uses and advantages of flamethrowers actually requires us to primarily consider the question of the legality of this weapon through this rule. The prohibition of superfluous injury or unnecessary suffering governs the use of means and methods of warfare and protects combatants while recognizing that a certain extent of harm caused them is allowed. Any attempt to discuss the legality of man-portable flamethrowers requires us to consider the way the IHL regime regulating weapons works, taking into account weapon characteristics and the manner they are used. This body of law essentially proceeds through two complementary methods of regulation, one based on general principles prohibiting weapons with certain effects, such as indiscriminate effects or superfluous injury or unnecessary suffering, and one based on specific limitations or bans of particular weapons partly in application of those general principles. Two further distinctions are paramount to the working of IHL norms on weapons. First those rules cover both the ‘means of warfare’—the weapons as such—and the ‘methods of warfare’—the way weapons are used. The latter also comprises any specific ways of conducting hostilities, whether in a tactical or strategic manner (and not necessarily specifically related to weapons), to outweigh and weaken the adversary. Examples include bombing as well as specific tactics used for attack, such as high-altitude bombing. Secondly, and closely linked to the distinction above, IHL norms operate taking into account the fact that the military utility of a given weapon can be anti-personal (used to incapacitate individuals), anti-material (aimed at neutralizing objects) or a combination of both. With this mind, unsurprisingly the question of the legality of the use of flamethrowers is framed by one IHL scholar as, ‘[p]utting collateral concerns aside, (…) whether the use of flamethrowers against military targets (a) is prohibited by a specific customary rule to this effect (b) would cause superfluous injury at all times’. That scholar doubts that flamethrowers would be prohibited on either basis. This comment rightly assumes the use of flamethrower is against legitimate military targets (be they individuals or objects)—the only sensible scenario where the rule on unnecessary suffering is relevant. However, a reference must first be made to the specific norm governing incendiary weapons that focuses on the protection of civilians. The only international humanitarian law (IHL) treaty norms specifically regulating incendiary weapons are found in the 1980 Protocol III on Prohibitions or Restrictions on the Use of Incendiary Weapons to the Convention on Prohibitions or Restrictions on the Use of Certain Conventional Weapons (Protocol III). However, one may first question the extent to which the flamethrower designed by Musk’s company qualifies as a proper incendiary weapon in the technical sense of the term. 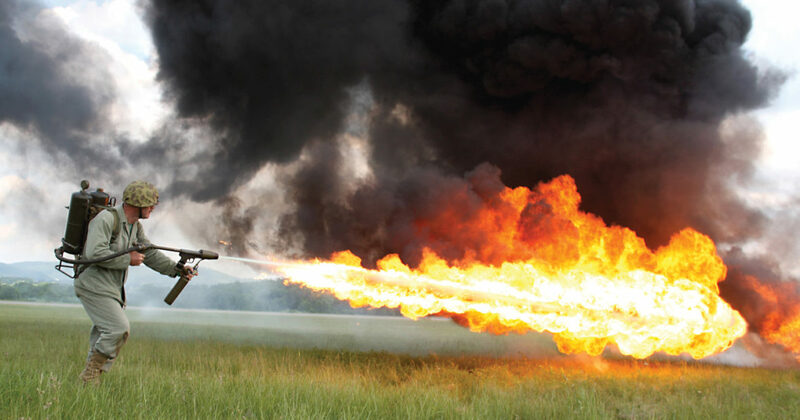 Indeed, as noted by a commentator, the flamethrower is ‘more reminiscent of an oversized butane-jet lighter than the fiery liquid mixture of nitrogen propellant and gasoline that defined the [US] Army’s M2 flamethrower during the Vietnam War’. any weapon or munition which is primarily designed to set fire to objects or to cause burn injury to persons through the action of flame, heat, or combination thereof, produced by a chemical reaction of a substance delivered on the target (emphasis added). The mere use of butane or other gas would not therefore be sufficient to make a device an incendiary weapon for the purpose of applying that treaty. In any case they would remain weapons using fire and heat to cause harm. Beyond this question, it is key to highlight that the norms contained in Protocol III only refer to limitations in use for incendiary weapons, and not to a blanket prohibition in all circumstances. This is a transposition of the rules on the protection of civilians, such as the prohibition ‘in all circumstances to make the civilian population as such, individual civilians or civilian objects the object of attack by incendiary weapons’ (Article 2). It is uncontroversial that any use of a flamethrower, be it a proper incendiary weapon or not, in breach of those rules on the protection of civilians would be unlawful. The same would hold true for any weapon. Does the use of flamethrowers cause unnecessary suffering? Historically, the emergence of the concept of superfluous injury or unnecessary suffering marked the development of the first prohibitions and limitations on weapons that revolved around the protection of combatants. The most contemporary formulation of this principle is to be found in Article 35(2) of 1977 Additional Protocol I that provides: ‘It is prohibited to employ weapons, projectiles and material and methods of warfare of a nature to cause superfluous injury or unnecessary suffering’. The test to determine what injury is deemed superfluous or what suffering is considered unnecessary, as recognized in State practice, lies into a comparison between the effects of the weapon and its military utility. The greater the military advantage of a weapon will be, the easier it is to justify the injury and the suffering. Indeed, the rationale behind the protection of combatants (or civilians directly participating in hostilities for that matter) is different from the one for the protection of civilians. Whereas civilians cannot be targeted, combatants are legitimate military targets who can be lawfully killed under IHL. On the other hand, the recognition of limits to the lawful infliction of death, injury or suffering against legitimate targets also illustrates the humanitarian essence of this principle i.e. the protection of the human being beyond the military function of combatants. In that context, the distinction between anti-personnel and anti-material weapons plays an important role in framing the application of the principle and clarifying its content. From the St. Petersburg Declaration onwards, the legal benchmark has been to assess what is necessary to ‘disable’ a soldier or put him ‘hors de combat’. The 1977 Additional Protocol I defines the term ‘hors de combat’ as follows: ‘a person is hors de combat if he has been rendered unconscious or is otherwise incapacitated by wounds or sickness, and therefore is incapable of defending himself’ (Art. 41(2) c). Explosive bullets under 400 grammes in weight in 1868 and expanding bullets in 1899 have been deemed to cause more harm than necessary to achieve this ‘individual’ goal of putting soldiers hors de combat. The situation is more complicated when one changes the scale or the context of the attack and the target. Weapons can be used against troops instead of individual soldiers and can cause greater harm than necessary to put one soldier hors de combat. Additionally, weapons used to cause material damage can often cause more harm to individual soldiers (located in, on or around that target) than would be necessary to put them hors de combat. In this case, the military utility would presumably shift from killing soldiers to neutralizing enemy arsenal or infrastructure. Therefore, the evolution of the military utility of a weapon may change the result of the equation, even in cases considered manifest at the time of the prohibition. For example, when explosive bullets of less than 400 grammes turned out to be efficient against aircraft, they became anti-materiel weapons. Their effects could no longer be solely assessed under the criterion of putting someone hors de combat. State practice consequently restricted the scope of the rule to antipersonnel use. It is, however, true that, to date, the concrete application of the general principle of superfluous and unnecessary suffering has proved to be effective mostly in regulating means of warfare that have inflicted manifestly excessive suffering and injury in the context of strictly anti-personnel use. Given the complexity of the notion of the military utility of a weapon, it is perhaps not surprising that most treaties prohibiting or limiting the use of specific means of warfare deemed to cause unnecessary suffering cover anti-personnel weapons with an individual purpose. In such a case, it is far easier to reach agreement on the application of the test balancing both elements. Whereas the principle was developed only for means of warfare, the provision in the 1977 Additional Protocol applies to methods of warfare as well, an element also part of the customary law norm despite a lack of clarity in the practice of some States. This means that the way a weapon is used may be deemed as causing superfluous injury or unnecessary suffering. This is a key element to bear in mind in the case of flamethrowers. Indeed, the ICRC Customary IHL Study identified Rule 85 that reads: ‘The anti-personnel use of incendiary weapons is prohibited, unless it is not feasible to use a less harmful weapon to render a person hors de combat.’ State practice exists qualifying the anti-personnel use of incendiary weapons as prohibited depending on the circumstances. For example the 1992 New Zealand Military Manual stated that ‘The use of incendiary weapons to cause unnecessary suffering is prohibited’ but that ‘A value judgement must be made in particular circumstances to determine whether or not the suffering caused is unnecessary’. The inclusion of a qualified condition related to the absence of alternative weapons illustrates the challenge in identifying a general prohibition of anti-personnel use. Indeed, even if the strict anti-personnel use limits the military utility of the weapon against which to assess the extent of injury or suffering, there are situations in which it is difficult to separate the objective of disabling individuals with closely linked military considerations. the stated purpose behind the use of WP munitions in Fallujah was to dislodge insurgent forces in order to make them vulnerable to attack with high explosive weapons. Thus, the primary intention behind the use of WP munitions appears not to have been to destroy enemy combatants through incendiary-related death and injuries. As a result, it is not possible as highlighted above to consider that the anti-personnel use of the man-portable flamethrower would in all circumstances be deemed as causing prohibited effects against enemy combatants. In cases where no alternative weapons causing less suffering exist, its use could be lawful in particular contexts where its military utility, the ‘ability to penetrate small openings and fill fortified positions with both fire and smoke’, outweighs the suffering caused. Conversely, if such conditions do not exist, a specific way of using flamethrowers could be considered as meant to cause superfluous injury or unnecessary suffering, as recognized by State practice. This brief, and by nature non-exhaustive, legal review should not downplay the suffering associated with the use of flamethrowers. The movie Saving Private Ryan offers another perspective to the whole debate over the use of this weapon. When German soldiers flee a bunker after an assault with flamethrowers, the U.S. officer orders his soldiers: ‘don’t shoot, let them burn’. While this behaviour does not question the lawfulness of the attack as such, it raises moral issues, in relation and beyond the strict legal analysis, of whether, in case of lethal injuries, soldiers should end the suffering of enemy combatants. Rule 85 is another one of the ICRC’s lex ferenda provisions (the law as they wish it to be, rather than the law that exists – lex lata), without any practice or opinio juris to support it as a customary international law provision. Incendiaries are not prohibited as a means of warfare against combatants. I would tend to agree with you as pointed out in the post. This is at the heart of the question of determining the extent to which the way a particular weapon is used is a matter regulated by an IHL general principle on the basis of relevant State practice/opinion juris with regard to that weapon and whether it is possible to identify circumstances of use making it banned in that case. In other words are there circumstances in which the anti-personnel use of a weapon is deemed as causing unnecessary suffering and whether it is at all possible to draw from that practice a rule whose content covers all such circumstances? While the qualified prohibition of anti-personnel use of incendiary weapons (“unless it is not feasible to use a less harmful weapon to render a person hors de combat”) in Rule 85 does restrict the scope of the alleged norm, as opposed to a prohibition of the anti-personnel use of incendiary weapons, it is indeed very doubtful that this qualification of the absence of other available is broad enough to cover all circumstances where the suffering caused by the anti-personnel use of incendiary weapons will be excessive to the military utility of rendering a person hors de combat. The ICRC Commentary to Rule 82 refers to the test “if it is feasible to use a less harmful weapon” to achieve that anti-personnel goal in order to consider the effects superfluous. There are two issues here: one is the interpretation of what is feasible and the other relates to State practice. The term “feasible” would mean that it is practically possible. It could be argued that cases exist where it is feasible to use other weapons causing less harm but that tactical reasons command to use of anti-incendiary weapons, such as if the number of explosive weapons at the time is low and that these would prove useful at a later stage of the battle. One could say that this is a scenario where it is actually not feasible to use other weapons. Secondly, and most importantly, given that State practice is very limited in this regard, and tends to rely on circumstances, it is difficult to draw a generic qualification as contained in Rule 85. Now I realise this comment comes closer to being a new post, but I would conclude on an optimistic note if I may. The whole point of that piece was to show that taking unnecessary suffering seriously requires to consider a wide range of factors. On the other hand, it was also meant to prove that even if it is very challenging to identify a specific customary law rule prohibiting a method of warfare (the way to use a weapon) causing unnecessary suffering for a specific weapon, it is unquestionable that State practice recognises that the use of a weapon, depending on a set the circumstances, can be deemed as causing superfluous injury. This principle therefore remains highly relevant but must be applied cautiously. Hope this would keep the discussion going!